What is Differin used for? Differin is a type of medicine known as a retinoid. It contains the active ingredient adapalene, which is a form of Vitamin A acid used to treat acne. Adapalene reduces the growth of the keratin surface skin cells that can block pores. This helps to unblock the pores and sebaceous glands so that the sebum can escape. As a result, the formation of acne (adolescent spots) decreases, allowing the skin to calm down. Differin is a prescription-only medicine for external use only. 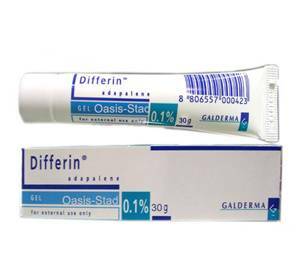 Differin is used to treat moderate to severe acne, a skin condition where the skin's pores become clogged, resulting in spots in the face or other areas such as the back. Acne is accompanied by oily skin, an overproduction of sebaceous matter, clogged pores and blackheads. Acne develops when overactive sebaceous glands become blocked and infected with acne bacteria. Acne generally starts during puberty when the skin is undergoing all kinds of hormonal changes. However, acne can also reappear during menopause. Differin reduces the production of sebaceous matter. It ensures that the skin does not become too greasy and prevents pores from clogging. Differin is available in cream and gel form. The cream is particularly suitable for dryer skin. Differin gel and cream should be applied to clean and dry skin, preferably at night before bedtime. Do not apply to broken skin and avoid contact with the eyes, mouth and nose. Wash hands thoroughly after applying this product. Differin makes the skin more sensitive to UV radiation. Therefore, you should avoid exposure to direct sunlight and sunbeds while taking this medicine. It may take a while for the benefits of Differin cream or gel to appear. Continue using it until you achieve the type of result you desire. If your skin has not improved in 8 to 12 weeks, you should contact a doctor. Adults and children aged 12 and above: apply the cream or gel thinly to the affected areas once a day. The doctor will tell you how long you need to use this medicine. Differin is not recommended for use in children under 12 years of age. Read the package leaflet before use. Skin irritation (tightness, itching, burning sensation) at the application site. Consult a doctor if the side effects are severe or bothersome. For more information, see the package leaflet. You are allergic to adapalene or any other ingredient in this medicine. Differin may interact with other medicines. The doctor will have a list of medicines that you should avoid mixing it with. See the package leaflet for more information about contraindications and potential interactions. Do not use Differin if you are pregnant or want to become pregnant. Differin can be used while breastfeeding with your doctor's approval. However, make sure you do not apply it to areas where it could be ingested by the baby or transferred to the baby's skin while you are feeding. This medicine does not affect your ability to drive. Differin does not interact with alcohol.